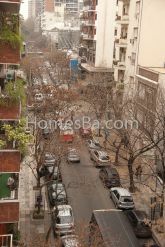 Very nice, clean, well kept and comfortable apartment in Belgrano, 2 bedrooms with balcony and open view of all environments, both the living room, kitchen and two bedrooms. It is a quite new building. Separate, full kitchen with breakfast table and door to the balcony. Main bedroom with in suite bathroom and small closet with mirrored doors. Second bedroom with 2 single beds. Mirrored closet doors. Small desk. Balcony overlooking the kitchen and living room with access from both. Floating floor in the living room and hallway. Carpet in the bedrooms. Both baths have exterior window. The living room has a table with 4 chairs; moving towards the window there is a 2 seats sofa, two chairs, a small TV-Cable 14". Air conditioning. Central heating. Radio/cd. Telephone ground line. Exit to the balcony from the living room or kitchen. Kitchen: Fridge with freezer, breakfast table with 2 chairs. Gas stove with oven and 4 burners , microwave, coffee maker and iron. From the living room there is a hallway leading to bedrooms. At the beginning of the hallway there is a complete bathroom. The main bedroom has a double bed (1.40 mts.) and in suite bathroom. Telephone here too. 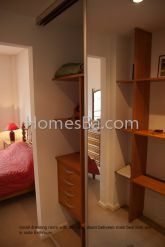 Between the bathroom and the bedroom there is a small closet with mirrored doors. Main bedroom has open views, bright and silent. The second bedroom has 2 single beds . Mirrored doors in closet, windows with open view, bright and quiet. 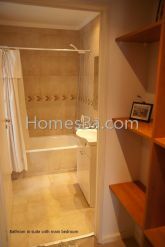 This is a nice and quiet apartment of 678 Sq.feet. Very comfortable for 4 people with 2 bedrooms, 2 bathrooms and separate kitchen.